Yes, but I've been demoing Pro-Q3 on desktop and it has some nice improvements, so if it's going to be a separate app I'd rather wait, but their appstore strategy is a bit unclear at the moment. I own the full suite of Fabfilter products on the desktop and can honestly say that Q2 is brilliant as it stands and the enhancements in Q3 are not essential ones (they are of course useful in certain instances). 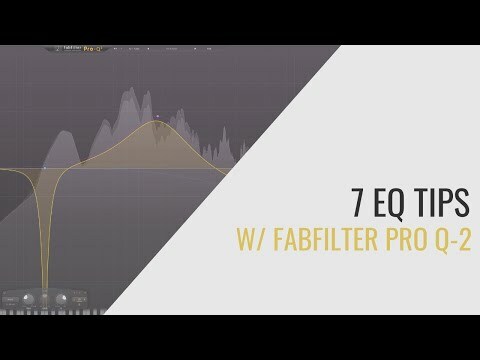 The reason to purchase Fabfilter Pro Q is simply that it's the best digital eq available on any platform. The mix of (minimal CPU) latency free, (higher CPU) natural phase and (higher latency) linear phase options have been the same since Q1and these are at the core of what makes Pro Q an essential purchase. Even if Q3 comes along 6 months time, Pro Q2 is still an essential purchase at the offer price. I have a general policy of not purchasing products I own as desktop plugins on iOS. But I purchased Pro Q first in Auria and then as an AU because quite simply it makes a world of difference to any audio chain. As some will know, I love nonlinear behaviour and saturation in all it's multiple personalities, and ProQ has none of this but I'll often place a Pro Q pre and post my saturation stage (filtering an audio signal before it saturates has a huge bearing on end results), as it's so cheap from a DSP perspective. Once you own a host/DAW and a few instruments Pro Q should be the next thing on your shopping list. Ui this came in by surprise. Question: do I need it ? Probably yes since it seems to be the best. Right now I am not the EQ guy but I feel the urge to get into it. Pro Q is not Universal? I thought i saw it universal some time. Will the Q3 be some sort of update or a complete new app? I read that customized curves cannot be saved. Still true? Unfortunately, Apple does not offer the technical possibility of upgrades or crossgrades. Pro-Q 3 will be released as a separate plug-in and separate purchase in the iOS app store, but we will probably use a highly discounted introduction price to ease the pain a bit... Fortunately, the overall price point on the iOS platform is very low already. Reckon it's coming soonish - from the FF website on the Q2 help page. "FabFilter Pro-Q 3 is not yet available as an AUv3 plug-in for iOS"
I really wish their next release was not going to be just the slightly updated version of their only auv3 that’s already available. FF doesn’t seem serious about iOS. I’m on team Klevgrand 😎 Still definitely worth picking up Pro-Q 2 though if there are any holdouts left. Now’s the time! I can’t save any presets I create on this version. It frustrates me that I have to hand-dial in a setting for an instrument each time on such a precise and powerful app. Hard to get consistent sounds when I’m winging it every go. Why did they skip that feature when it is on the Auria version (and every other version)??? Everything saves inside the host. it works great and recalls the Pro-Q 2 setup perfectly. but yeah I can see why it can be limiting and frustrating. I'm used to using host saving on the desktop so the lack of the facility in the Pro Q AUv3 didn't faze me, but I do understand that it's alien to many. Fairly soon we'll be able to save presets on a per lane/channel/matrix basis in AUM, AudioBus and apeMatrix so that should ease peoples pain. The processor overhead of using a sub-host within your DAW of choice is minimal so I think its something to consider. The added benefit of doing things this way is data portability. On many occasions, you don't want the weight of a DAW as you're only sketching/doodling. By hosting your plugins in AUM, AB or aM, you're ensuring that those FX/instrument chains are available to you in any DAW or indeed within another host if you own more than one. What does Pro Q2 do that Waves IAP in Cubasis doesn't? Waves is a native built-in to Cubasis and so, it should consume minimal memory as opposed to an external app that could consume more memory. What features of Q2 are superior to Waves? Does it have any features that Waves lack? Someone who used both could throw some comparison light. In my older comparison of native vs AU eqs , i could load about 100 waves native EQs or 123 FabFilter Pro Q-2 AUs in Cubasis before hitting the 100% cpu mark in Cubasis. @MobileMusic Pro-Q 2 has incredibly deep features that go way beyond Waves q10. Just look up the websites for each to compare. At quick glance, Pro-Q has a very precise graphical waveform display behind the graphical EQ which shows pre/post audio spectrum. I love this feature. Waves doesn't have any graphical display of the waveform does it? Also I think Q2 is 32 band. Waves has 10. Pro-Q 2 is extremely efficient with CPU on iPad, so I would not let that hold you back. I don't use Cubasis, so I can't compare the two plugins usage and sound quality on iPad . I think if you are happy with Waves as a basic 10-band EQ, you'll be fine without Pro-Q 2. But if you want more, Pro-Q 2 has a pretty much everything you could ever want from an EQ. full stop. The Wave IAP and Virsyn EQ in AudioEffx are of the same caliber as the Fabfilter Pro Q's (standalone and channel strip) from a pure audio quality perspective (as is Goto EQ). But the Fabfilter is by far the best UX/UI and that counts for an awful lot. It has better modes of operation (latency free through to higher latency Linear Phase options). You have a wider amount of options for each EQ node you add (bell, low shelf, high shelf, high cut, notch, band pass and tilt shelf). All node options allow 12 dB/oct to 96 dB/oct cut/boost which are incredibly useful for high q surgical cuts and high and low filtering (and having linear phase options in combo with 36-96 dB cuts is essential or you'll end up with possible phase cancellation problems). And my favourite feature, the waveform visualisation is very accurate (vital for nailing those problem frequencies) and the scale of the graph can be changed between 6dB and 30dB. This balances out to a whole lot more than the Waves IAP. Maybe making money on this first AU will encourage the production on more FX. Gotta love your glass half full sense of optimism.